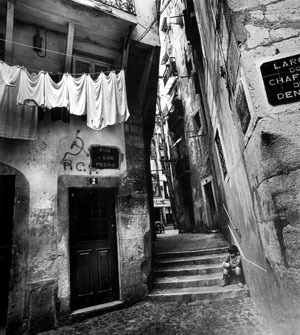 I resume my walk-about along the streets and alleyways of Lisbon, and it’s only a minute or two before I spot this young boy, huddled into a corner of a stairwell, underneath his granny’s canopy of drying towels and pillowcases. He’d like to make himself invisible by pressing tight against the stonework, hoping to slip away to join his friends playing kickball on the next street. But granny keeps a close eye on the family treasure, calling down to him every few minutes as she shakes the sheets and blankets, and banishes dust kitties from the rugs. It’s doubtful he’ll outwit her eagle eye.